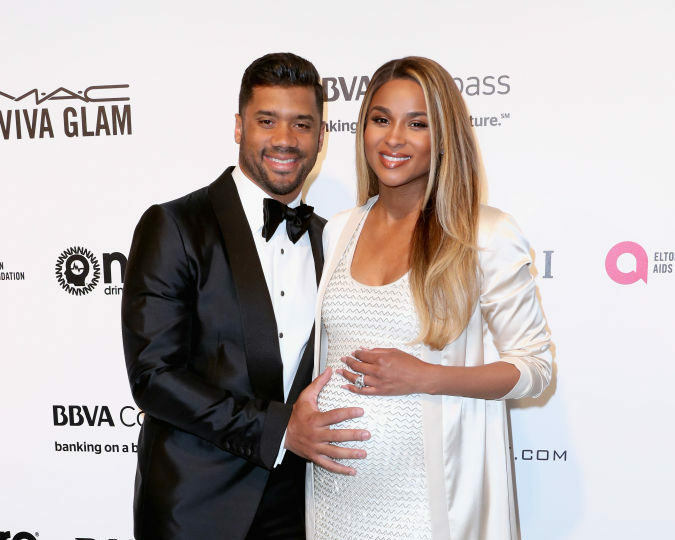 Just a few days ago, singer Ciara and her husband, Seattle Seahawks quarterback Russell Wilson, took to Instagram to announce the birth of their daughter, Sienna Princess Wilson (love that name!). Now, Ciara has shared a beautiful black-and-white video of herself and Wilson from a beach getaway the couple went on just before Sienna was born. The video shows Ciara and Wilson strolling along the beach and laughing, looking *so* in love. Sienna is the couple’s first child together, and Ciara also has a son (three-year-old Future, with her ex, the rapper Future). Wilson and Ciara began dating in early 2015 and announced their engagement in March of 2016, before getting married in July in England. The couple announced their pregnancy on Ciara’s birthday in October and haven’t stopped being adorable since. Back in February, Ciara posted a video of her dancing and lip syncing to Chaka Khan’s “I’m Every Woman” as Wilson and little Future looked on. Ciara and Russell seem so excited and we can’t wait to see the first pics of little Sienna. We know Ciara and Russell are going to be amazing parents and Future is going to be the best big brother!